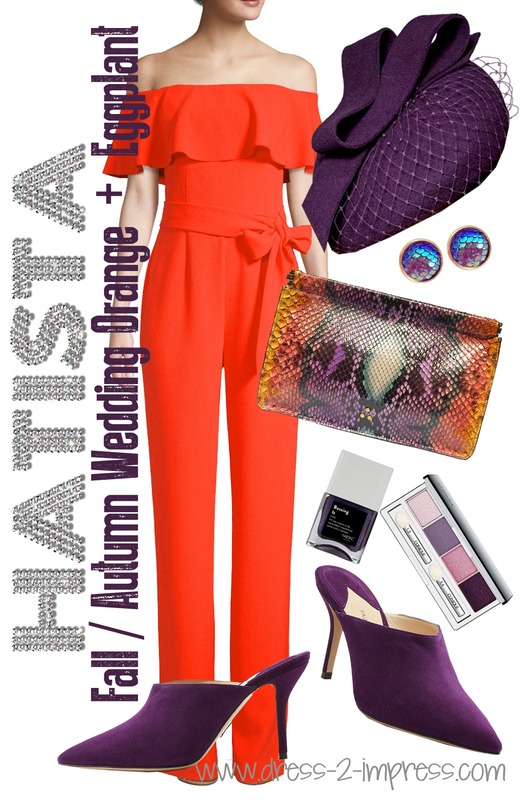 The Hatista - What to wear to an Autumn Wedding. Autumn Wedding Guest Outfits. Ideas for an Autumn Wedding. Fall Wedding Outfits. Autumn Fashion Outfits. 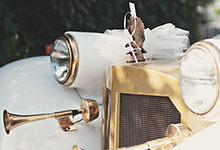 Summer, and especially August, has long been defined as the wedding season for it's warm weather promise. But, I've noticed Summer is getting edged out as the signature wedding season. In recent years 'Summers' have failed to deliver guarenteed warm weather, wedding guests are away on holiday during school break, and the venue costs are higher. People are reconsidering if Summer really is the best time to get married, and Autumn is now proving the more popular season. 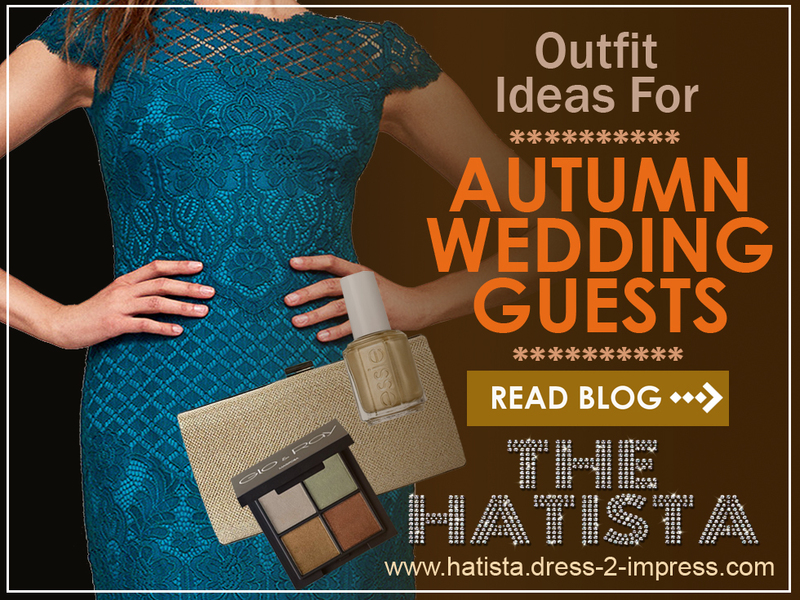 If you're attending a Fall / Autumn wedding, the number of colour combinations for Autumn Wedding Guests outfits are endless. The Autumn is my favourite season to dress for. Look at nature and be inspired by all the great colours. The Autumn leaves, conkers and chestnuts offer a huge variety of Browns, Reds and Oranges that are all great outfit colours for Autumn weddings. Think of your Favourite personal colour and there will be an 'Autumn leaf' to pair it with I guarentee. 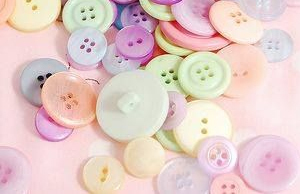 For example if your favourite colour is mint, it will pair brilliantly with dark chocolate brown. If peach is your favourite colour, mix it with Autumnal claret red. Tangarine orange is your fave? It's a dream with Auburn Red/Brown. You get my gist? For weddings at the beginning of Autumn think satin, heavier silks, and shimmering materials in colorful tones of mustard, chocolate or Jewel tones. The fabrics switching to velvets, beaded fabrics and jacquard later in the Autumn. Lace wedding guest shift, pencil or midi dresses with different colored shifts underneath are a current trend. 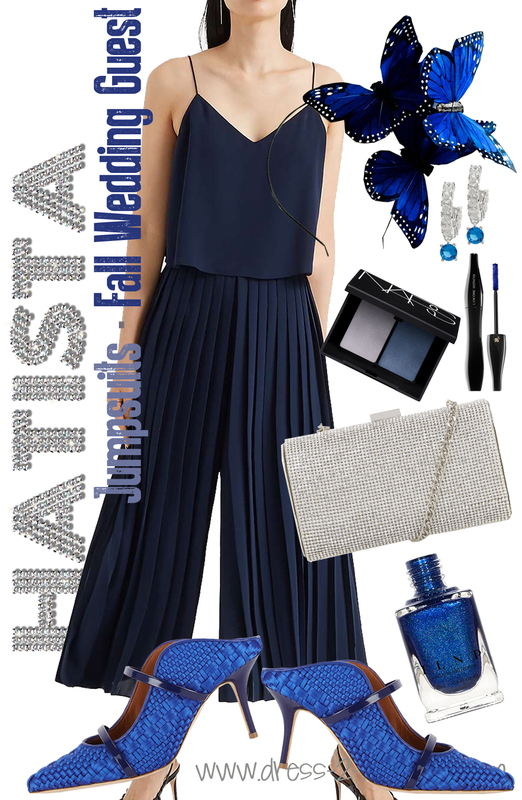 Autumn weddings are the perfect time to consider Jumpsuits in Autumn fabrics. A cropped trouser tailored suit with killer boots are another option of course. If you prefer to stick to dresses, then Midi Length, either in A line or pencil, would be the hem length to look for. Mini of course is to short unless paired with thick tights, and maxi length (in my personal opinion) is for the Bridesmaids. Suit and Jacket, Dresses, or Jumpsuits, all have great options out there with Bell Sleeves - another fashion that is very hot at the moment and perfect for flirty fashion in the Autumn. If you want to create a warm Autumn wedding outfit, here are our some outfit ideas I've found myself working with, to inspire you. 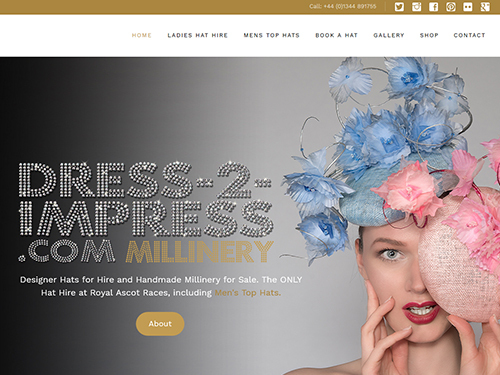 The headpiece hat is Dress-2-Impress. 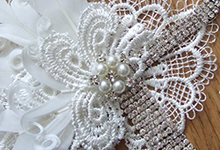 Click Here for Headpiece. The Dress is Wallis. Click for Dress. Eyeshadow: Charlotte Tilbury. Click for Eyeshadow. Lip Gloss: Urban Decay. Click for Lippy. The Shoes are: Hobbs. Click for Shoes. Autumn is the season for dozens of Jumpsuit options. Choose those in Lace, shimmering crepe or satin for formal. Keep the jerseywear jumpsuits for casual or you could be accused of wearing a onesie. Another current trend is the cropped flare or wide leg trouser suit, which you can wear with killer ankle boots. The Jumpsuit is: Adrianna Papell. Click for Jumpsuit.. Felt Headpiece: Etsy. Click for Headpiece. Shoes: Marni. Click for Shoes. Liquid Eyeshadow: Bourjois. Click to see Eyeshadow. Liquid Eyeshadow: L'Oreal. Click for Eyeshadow. There is an Coral outfit for every season. For Late Winter or Autumn my favourite is paired with Burgundy. The Coral keeps a summery feel, when going all bright is either too early, or too late in the year. These two colours are the perfect mix of cool and warm. 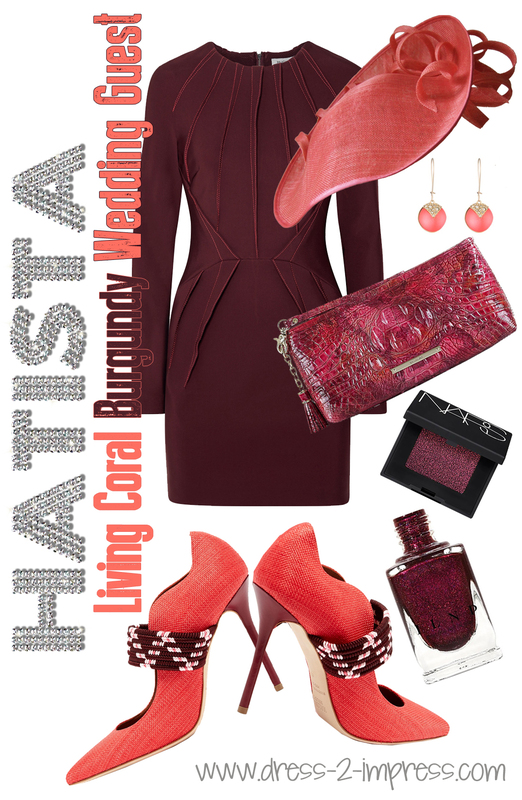 For More Ideas on how to wear Coral (Pantone Color of the Year 2019) you should also read the How to Wear Coral Outfits post. 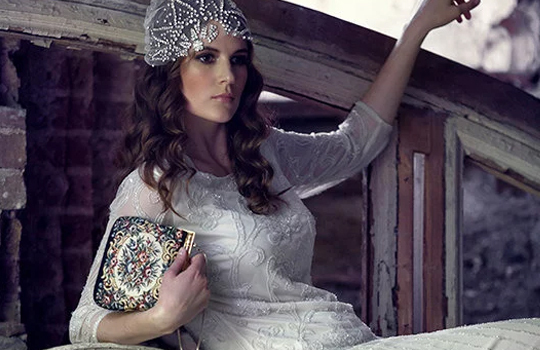 The Coral headpiece illustrated with this outfit is available to buy from www.dress-2-impress.com.Click Here. Earrings: Alexis Bittar. Click for Earrings. Bag: Brahmin. Click for Bag. Eyeshadow: Nars. Click for Eye Shadow. Nail Polish: ILND. Click for Nail Polish. Teal has an ultralux vibe and always looks stunning applied to Autumn fabrics like lace, wool, jacquard, suede and velvet. Just about all neutrals will pair well with teal, but especially Grey, Gold, Navy and Charcoal. Teal is a colour that is neither too bold or too dull. A bright dark if you like. For this reason teal can be worn head to toe if you like without being to bright or too boring. A lot of people will choose teal as a favourite colour to wear because of it's midway tone that suits most skins. The Lace Dress is: Tadashi Shoji. Click for Dress..
Gold Fascinator: Etsy. Click for Fascinator. Shoes: Pinko. Click for Shoes. Nail Varnish: Essie Getting Groovy. Click for Nail Varnish. Eyesahow Set: Glo and Ray. Click for Eye Quartet. 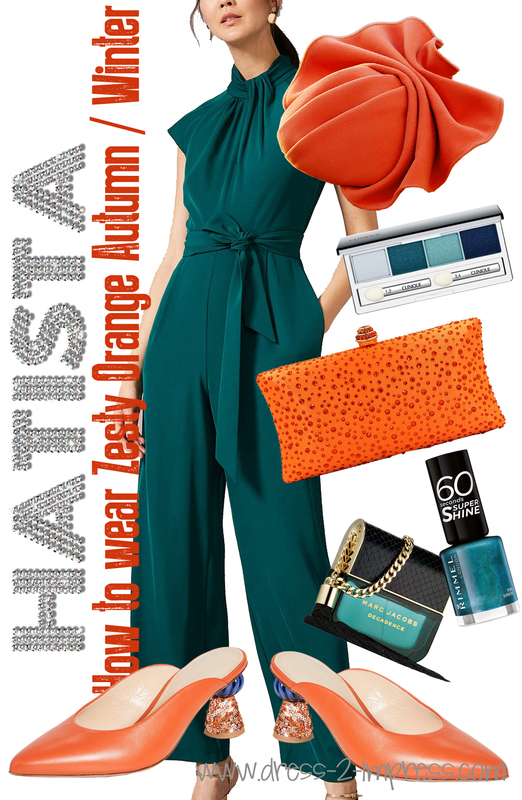 For Autumn through Early Winter Orange is a favourite paired with Teal. With Teal at the helm you're in Autumn colours, while the orange gives a warm feel and is true to the orange tones of freshly fallen leaves. Full of prep and spontaneity, these colours are the perfect mix of cool and warm. This is another combo that has depth and a playful flair. Shoes: LK Bennett. Click for Shoes. Emerald Green combined with gold always looks wonderful, and is perfect for an Autumn, Winter or Christmas Wedding Guest. Emerald Green is for everyone. It suits everyone regardless of skin tone, hair and eye colour. 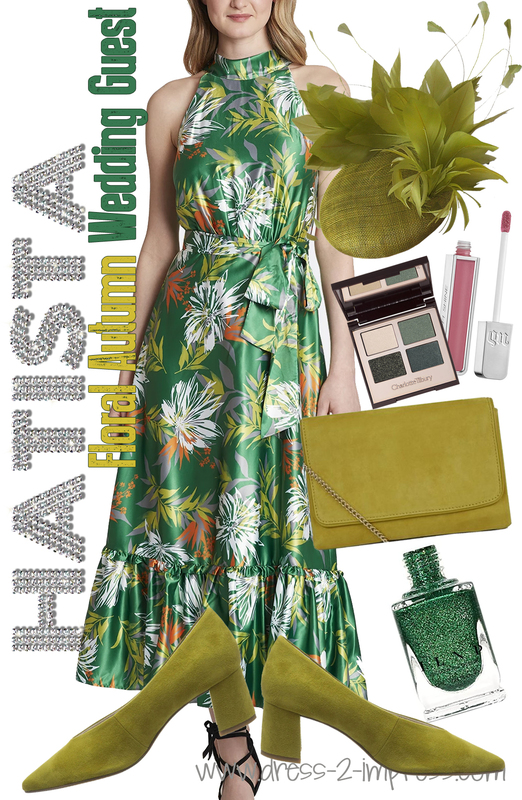 Emerald green is a luxurious jewel colour, so it’s an ideal choice for wedding guests outfits and never fails for a wedding in any season, hence many will refer to it as their favorite colour. For More Ideas on what to wear with Green you should also read the How to Wear Green Outfits post. Lace Dress: Tadashi Shoji. Click for Dress. Leather Crown: Etsy. Click for Crown. Shoes: Sophia Webster. 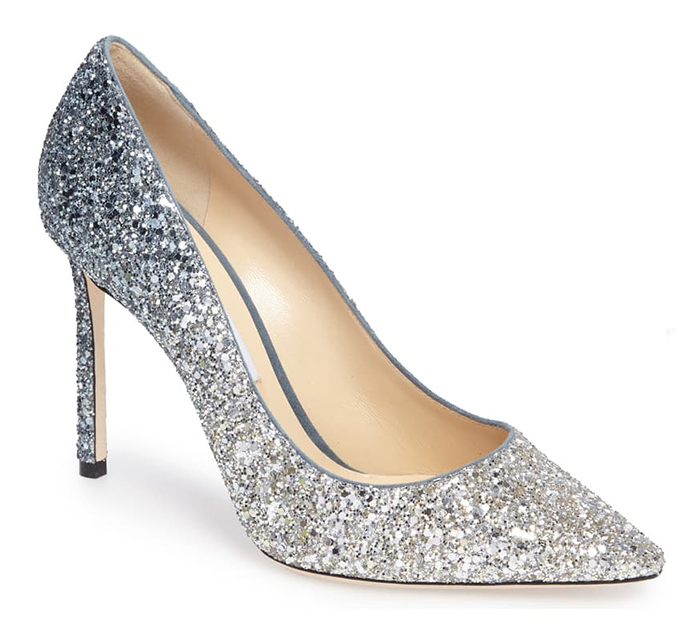 Click for Shoes. Nail Polish: Rimmel. Click for Nail Polish. Perfume: Gucci. Click for Perfume. Eye Liner: Rimmel. Click for Eyeliner. Eye shadow: Mii. Click for Eye shadow. 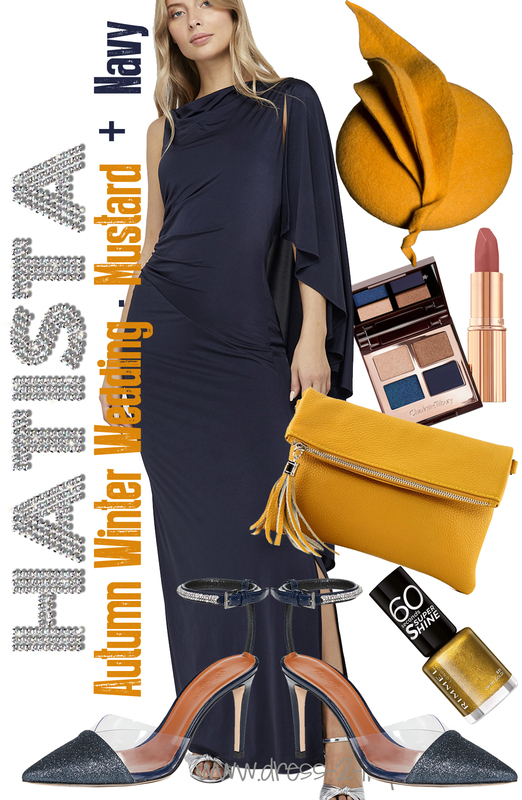 You don’t have to go Black, Brown or Grey for Autumn / Winter Weddings. 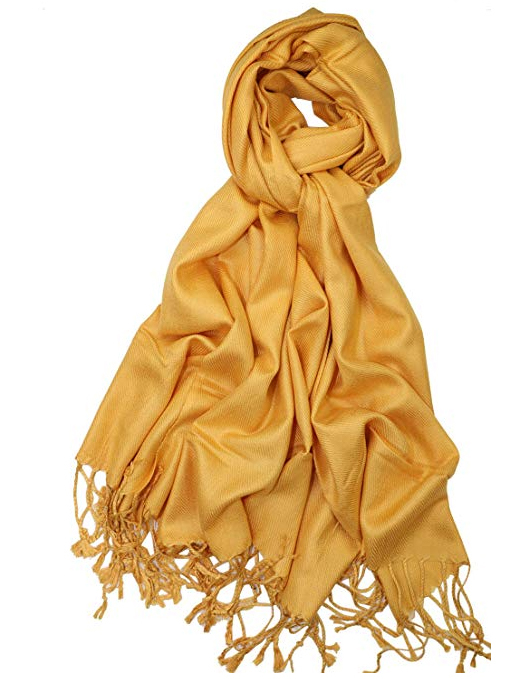 Neither am I suggesting you wear super bright sunshine or lemon yellow, but Mustard and Saffron hues are divine in Autumn, worn to add a colour pop to Neutrals. 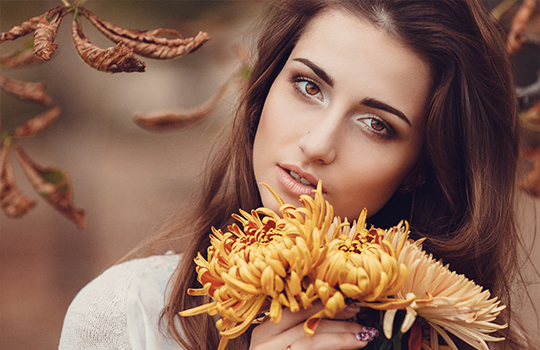 These spiced yellows are a rich Autumn shade and will bring contrast to your paler skin. Definitely avoid pale or pastel yellows in winter. For maximum creativity, Mustard, Saffron and Ochre will also work with Deep Green, or Burgundy. Avoid wearing a Black outfit with Yellow accessories as that looks a bit "Bumble Bee", but any of the other neutrals will make a stunning outfit for fall or winter weddings. The Navy Lace Jumpsuit is: Little Mistress Click Here for Jumpsuit. The Saffron Felt Percher Hat Fascinator is: Etsy. 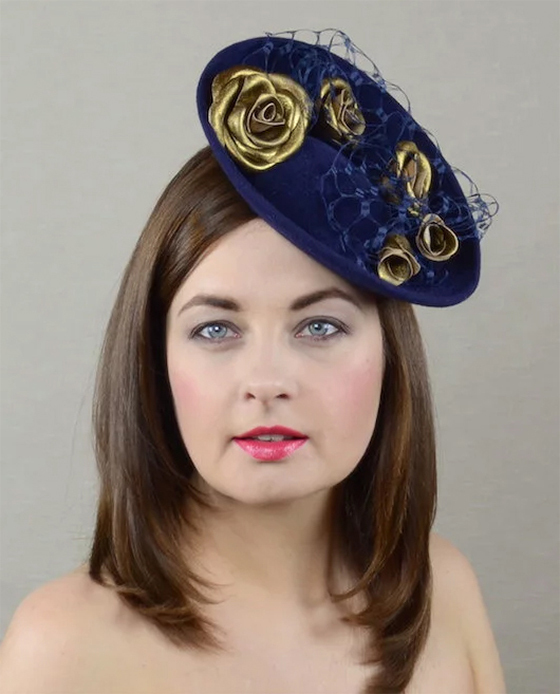 Click to see Felt Fascinator . 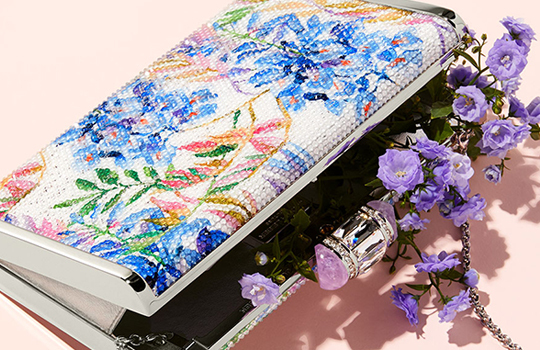 The Velvet Clutch: Etsy. 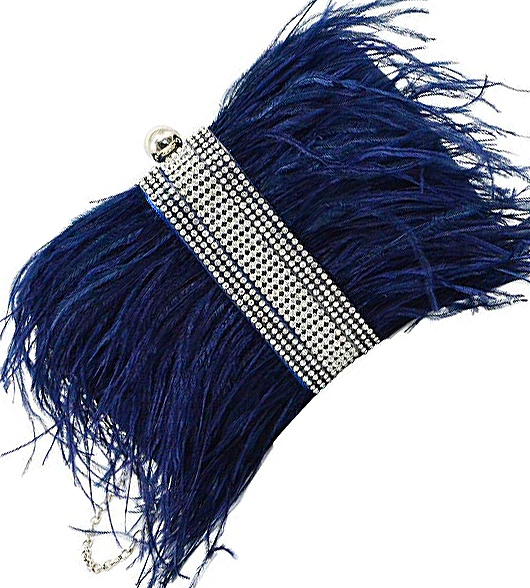 Click for Velvet Clutch Bag. 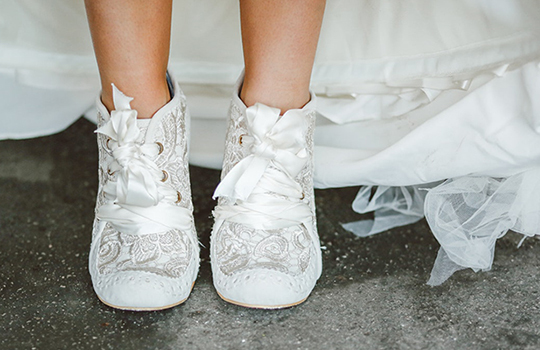 The Shoes: Tory Burch. Click for Tory Burch Feather Shoes. Nail Varnish: Naj Oleari. Click for Yellow Nail Varnish. Blue Eye Paint: L'Oreal. Click for L'Oreal Infallible Eye Paint. Gold Eyeshadow: Illamasqua. Click for Illamasqua Powder Eyeshadow. 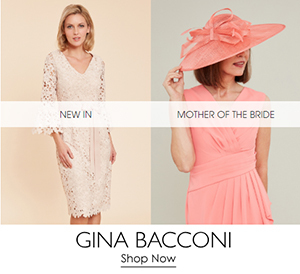 Wedding Guest or Mother of the Bride Outfits for Winter Weddings.